ARIA digital cards are designed to work with Open Source based VoIP platforms such as Asterisk® (e.g. PBX in a Flash®, FreePBX® Elastix®) &Free SWITCH®. ARIA’s Line Cards are manufactured in state of the art ISO 9001:2001 certified facilities in India. 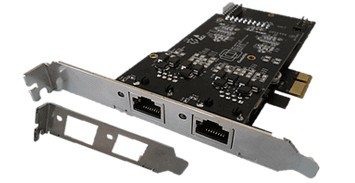 ARIA’s CF-01 series PCIe cards are high-performance, cost effective telephony cards available with carrier grade optional hardware echo cancellation. The CF-01cards allows up to 24 (T1) or 30 (E1) channels. 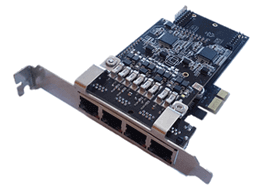 ARIA CF-02 series PCIe cards are high-performance, cost effective telephony cards available with carrier grade optional hardware echo cancellation. The CF-02 cards allows up to 48 (T1) or 60 (E1) channels. 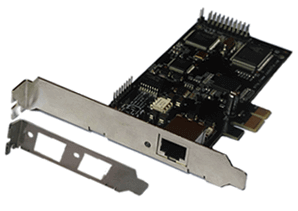 ARIA CF-04 series PCIe cards are high-performance, cost effective telephony cards available with carrier grade optional hardware echo cancellation. The CF-04 cards allow up to 96 (T1) or 120 (E1) channels. Q1)	Why am I not receiving DID calls even after enabling it in extension.conf? It may due to the method by which the telco sends calls to your line. Try these troubleshooting. Type “reload” in the console and call in. DID should come into your T1/E1 line. Q2) How to determine the status of LED depending on the colors displayed? Q3) How to resolve dialing out issues when it stops dialing multiple channels? Check the “PRIDIALPAN” option to ensure that the card is dialing in the same method as your telco works with. Q4)	MY D channel is fluctuating, how to resolve? Check your card parameters first. Check if the PATA IDE hard drives are running with set DMA levels. Q5)	How to resolve DID information issues over E&M? It may be due to mismatch of E&M type with your telco system. Try using other types of E&M and see if the problem is resolved. Q6)	How to get PRI issue notification over D channel? Type in “CLI> PRI debug span X” command and in the place of “X” enter the form of port you are using. Q7)	How to enable maximum features? This will enable all the features of your card.